Deed Calls - Grid - Stakeout for iPAD, iPhone and iPod touch provides the functions for creating an area by entering deed calls, generating grid points over the area, as well as locating the area boundary and the grid points. 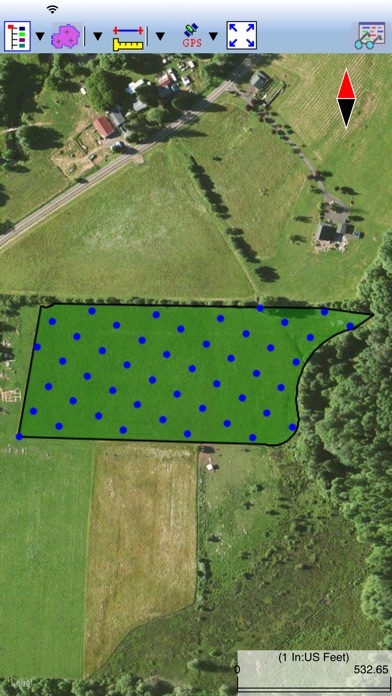 These functions are very helpful to foresters who need to create a deed plot and add a grid of sampling points for timber cruising or stand survey. Farmers could also use these functions to help them navigate to sampling points for taking soil samples. To make use of the Stakeout functions, your device needs to have built-in GPS or be connected to a compatible external GPS. 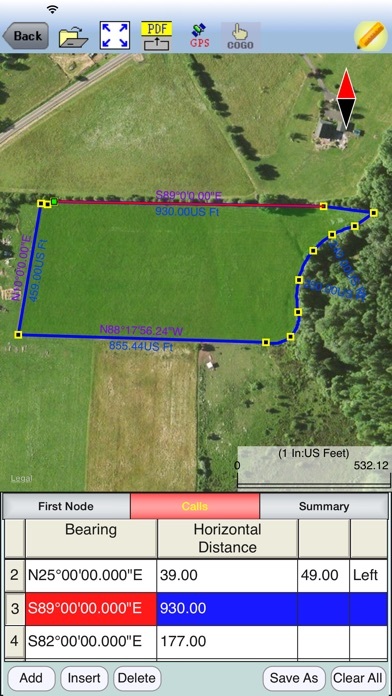 The Deed Calls function will let you specify the starting point, orientation angle and units of measure, and the app will draw the property boundary as you enter the angles and distances. It will display the angles and distances as well as the closure error, total area and perimeter. The points and area boundary can also be created by digitizing over the displayed background map. The Grid function will let you create grid points or grid lines at the specified orientation and spacing. You can create a square grid or a rectangular grid. 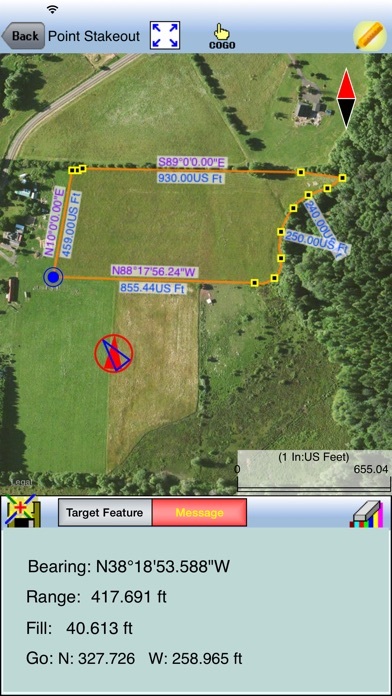 The Point Stakeout function will help you navigate to individual grid points or stakeout the nodes on the deed plot. The Line Stakeout function will guide you in moving parallel to the outline of the deed plot or along any line feature you have digitized. You can turn the navigation beeps on or off as you please. 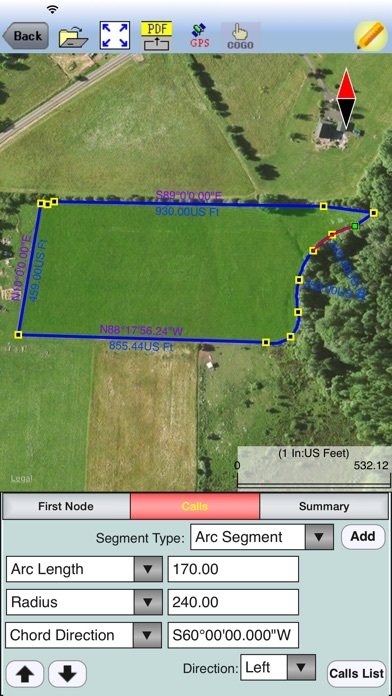 This app also provides the Measure Distance and Measure Area functions as well as the ability to export the Points, Line and Area Features to a DXF file and to export the deed plot and deed calls to a PDF file. You will be able to use this app for viewing any PDF file stored in the Documents folder of this app. In addition, you will be able to email the job files (*.pmp), the Deed Calls files (*.dcf), the DXF files and the PDF files to yourself or to a colleague. Please note: Location data depends on the GPS receiver used. Continued use of GPS running in the background can dramatically decrease battery life. This app will let you easily toggle the built-in GPS on or off. More by CORVALLIS MICROTECHNOLOGY, INC.